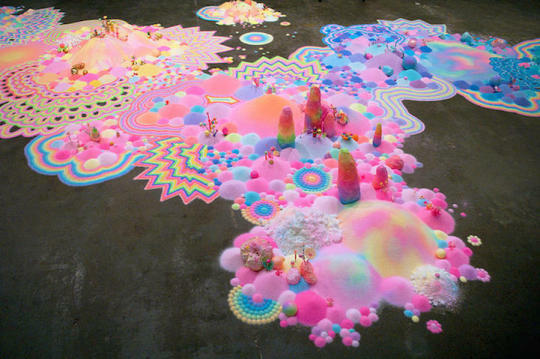 Operating under the name Pip & Pop, Australian artist Tanya Schultz uses a combination of colorful candy, glitter, sand, toys, beads, and other bright objects to create gloriously dreamy, intricately patterned floor installations. Viewers experience the thrill of a sugar rush as they feast their eyes on Schultz’s spectacularly fluorescent works of art. Sweetly girlish and visually dynamic at the same time, each piece is a whirlwind trip to neon-colored dreamscapes and candylands filled with saturated rainbows and sensory overload. Pip & Pop began in 2007 as a collaboration between Schultz and fellow artist Nicole Andrijevic. In 2011, Andrijevic left the duo to pursue a different path, while Schultz has continued to create elaborate installations both individually and collaboratively with other artists and friends.